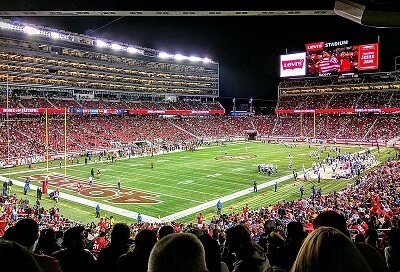 Get notified when San Francisco 49ers tickets are available! The San Francisco 49ers are a popular American professional football team based out of the San Francisco Bay Area. They are a part of the National Football League and have been since 1949. They play their home games at Levi’s Stadium in Santa Clara, California. Levi’s can accommodate up to 75,000 fans. The 49ers have won 5 Super Bowls between the years 1981 and 1995, and have also won six conference championships between 1981 and 2012. The 49ers are the 4th most valuable team in the NFL, according to Forbes. You can see the 49ers at home or away by purchasing San Francisco 49ers tickets using the links above.